Wipaq offers products not just for public use, but also for areas within an office zone or an industry zone with its ht70 turnstile revolving door feature. This guarantees a private gateway for the person and can be accessed with an ID card. The HT 70 Revolving Door Turnstile has been designed with smooth, modern lines to blend with a variety of building architecture. The HT 70 Series is crafted of 6005-T6 high strength aluminum extrusion and features GE's transparent Lexan® polycarbonate cage panels and arms for an un-caged feel and appearance. This full security, card access, tamper-resistant revolving door is designed for locations requiring improved visitor security or as the barrier between production and office areas. 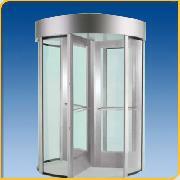 The HT 70 Aluminum Full Height Turnstile may be ordered in a variety of different configurations. Please call for details.